It is carnival time here in Germany. For the past few weeks (officially since Nov. 11 at 11:11am), and for the next few, wigs are out, crazy hats and bright scarves are on, and 'hellaus' are being yelled on the street! Carnival is the official indulging party before the unofficial fasting of Lent begins...this craziness is almost church-sanctioned. 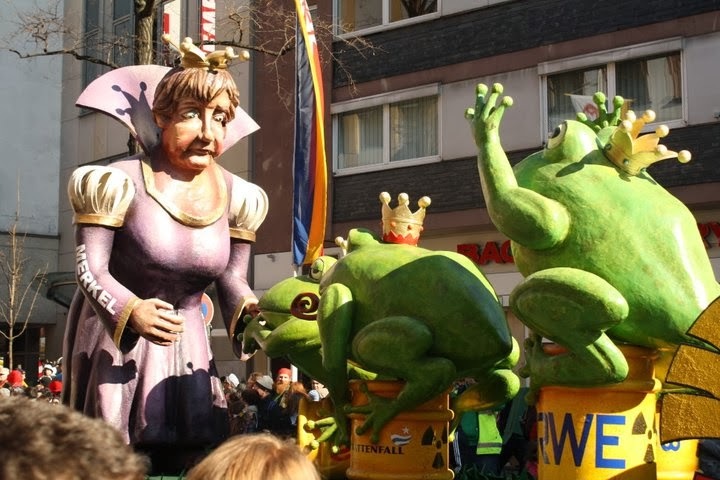 Mostly it is tame enough, with the world's oldest carnival parade (dating back to 1823), hosting millions of revellers and fools in Cologne - this year on March 3 (Rosenmontag). 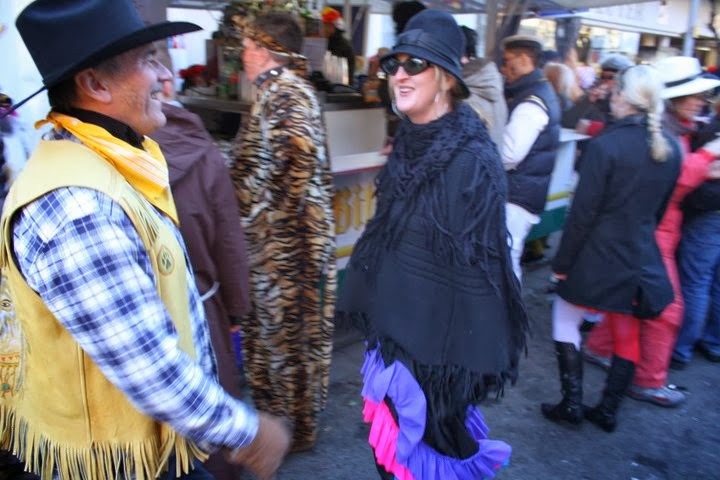 If you happen to be in the area for this year's carnival festivities or next year's, here are my top 10 tips on making the most of this rich-in-tradition, community-bonding, special-friend-making, all-around-fun party. 1. Find out what ‘hellau’ actually means (or I can just tell you here). You will be hearing this a lot the moment you are in costume, or if you pass someone on the street who is with mask. I don't want you to make the same mistake others might have made; excitedly replying to everyone, HELLO! HELLO! because for some reason you think they all of a sudden know you speak English. I barely know anyone who's done that. 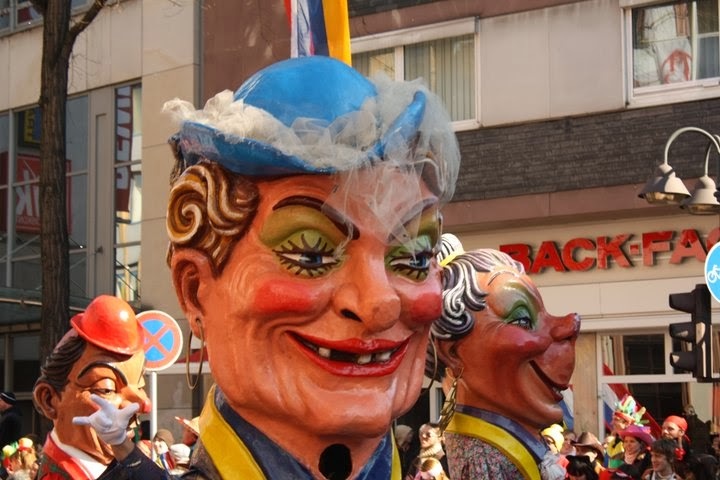 ‘Hellau’, which does sound surprising similar to 'hello' to the untrained ear (trust me) is the standard carnival greeting. Why it has to sound exactly like a German person saying ‘hello’ is meant to just confuse tourists, I think…or to make Germans seem friendlier. 2. Stay on the right side of the Rhine (the left). 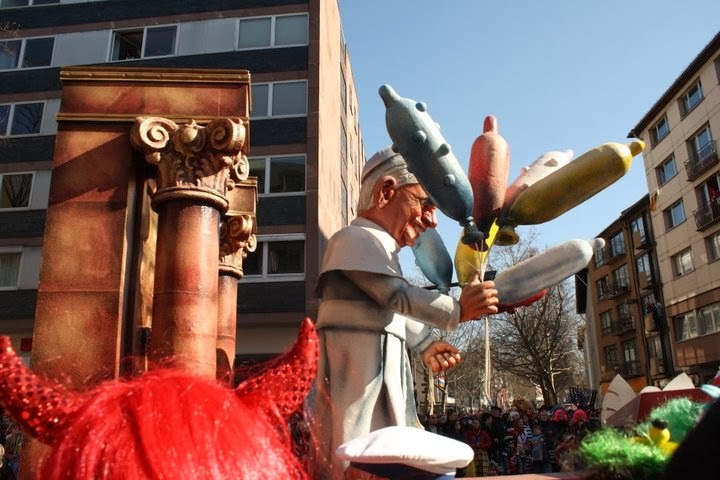 If you are coming to the Rhine area to partake in carnival revelry, then you will need to know where the Catholics are. They are all along the left side of the Rhine. If you see the pope or some nuns, dancing and having a good 'ol time then you are on the right side of the river! As far as I can figure it out, the Rhine river was the thorn in the French army's side, stopping any further advancements back in the day. I'm talking, way back, like 1814 when Germany got the left side back. But, the Germans kept some of the fun stuff, like more Catholics, carnival (although some would argue that carnival was born out of medieval folk culture) and the number eleven. Carnival clubs (who plan all of the festivities in each German town and city - only on the left side of course) are called the "Elferrat", not having anything to do with elves - another common confusion, especially if they happen to be dressed as such. "Elf", which is "11" in German, is the acronym for 'egalité, liberté, fraternité' - the values of the French Revolution. 3. Keep wigs close at hand. You never know when you will be invited to a carnival party at the last minute...there are many. Or, if the costume you had planned to wear doesn’t really work (or is all of a sudden two sizes too small). So grab a wig, any kind of crazy dress (or just make it crazy), hang 18 different necklaces around neck, and pile on some flaming red lipstick - you’ll be ready to go. Everyone looks great (and a little crazy) with blue hair! 4. Hydrate – and I do actually mean with water. Drink lots of water, constantly. First of all, water is healthy. And, secondly, you will lessen the negative side-effects of dancing through the streets, drinking sparkling wine and singing with strangers…for the entire day…starting at 11 am. During carnival everything starts at 11 am. So drink lots of water, or by 3pm you’ll be lying elegantly on the pavement or snoozing on the train. 5. Go with a friend or three. You will most certainly be taking the train or subway to all or most big carnival events. The only way for a city to gather hundreds of thousands of people within a few blocks is for the crowds to use public transport. 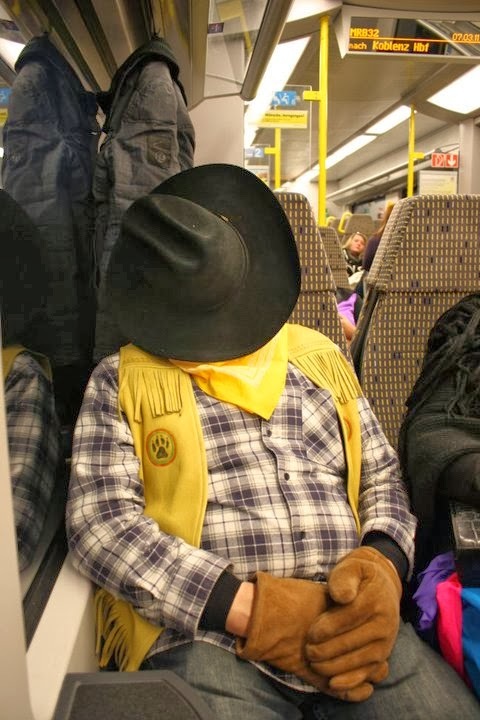 Learn to love the train…even if there are drunk, singing hooligans on board. That is why having friends with you will be much more fun. Dance, laugh, take photos, eat a bratwurst. Make your own happy party, the way you like to party, with the people you like and you will have a super fun day…of singing (and a little dancing). 6. 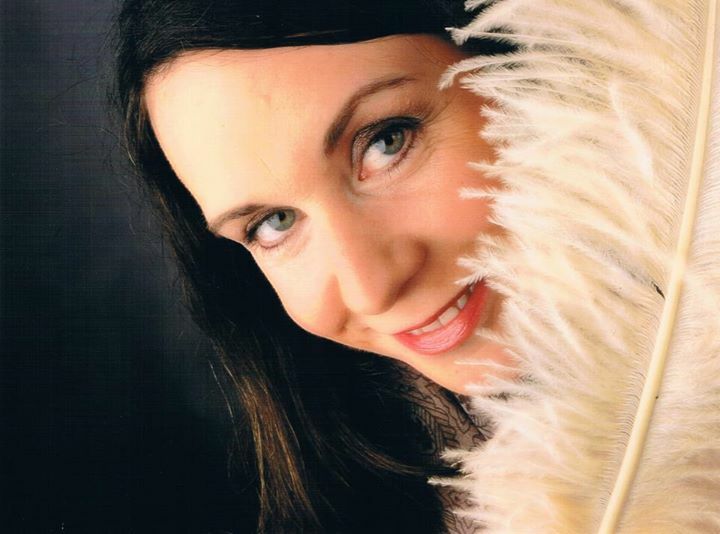 Take singing lessons…but only if you want to make new friends or keep the old ones. As I have already mentioned, you will singing. One of the very best things about Europe is that people sing! Whenever there is a festival, sporting event, or just lots of people gathered together, there is singing. Young and old, strangers and friends, the tone-deaf and the less tone-deaf - people sing and sway together all the time. I love it. Sure, everybody is just a little bit zoused most of the time, but it sure is festive. 7. Brush up on your politics. Carnival is traditionally a time to let your hair down and be free; say what you want, do what you want, eat and drink what you want. Almost every carnival gathering is a minor revolt against the 'big bad system' – so make sure you understand a little bit of what is happening in politics, the economy, or just the 'news' in that neighbourhood - the parodies will most likely mention the 'hot button' topics of the day, whether on a stage, on the street, or on a float. 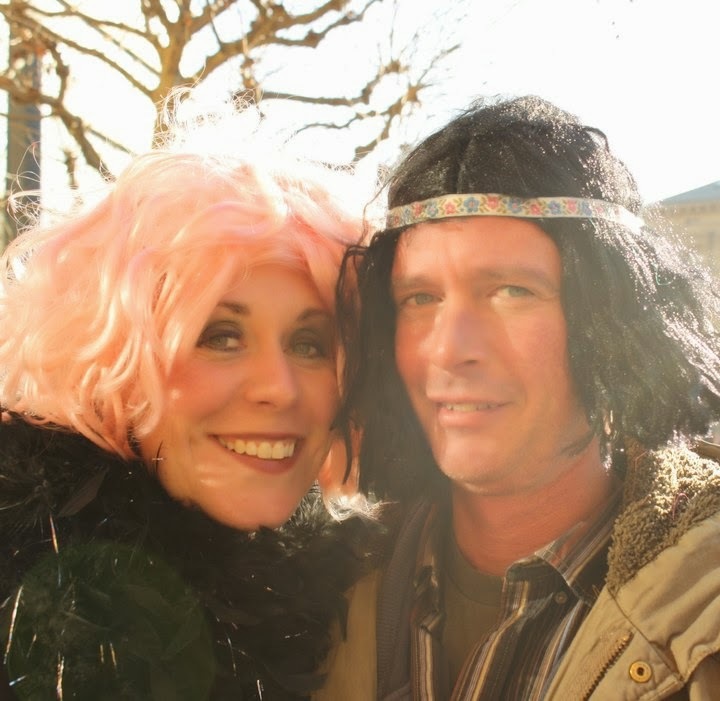 A great, revolting example, is the story behind Weiberfastnacht - or 'Old lady/hag day'. This is celebrated on the Thursday before Rosenmontag, and is not a day to hug a senior as the name may suggest. On this day, in 1824, the washer women decided they had had enough. They threw down their buckets and stormed the city (an exaggeration) and took over for the day. Now, apparently, only on this one day, women have total control. They go around cutting off men's ties (not sure why) and are allowed to kiss any man they want. Isn't that just a normal day? If you are planning on really adopting carnival into your social calendar then make sure you find employment in the right provinces. As mentioned before, the less Catholic and more right situated provinces do not acknowledge that this mayhem exists. Therefore, if you want a lenient workplace; a boss who understands your bloodshot eyes and your numerous sick days, then work on the left side. 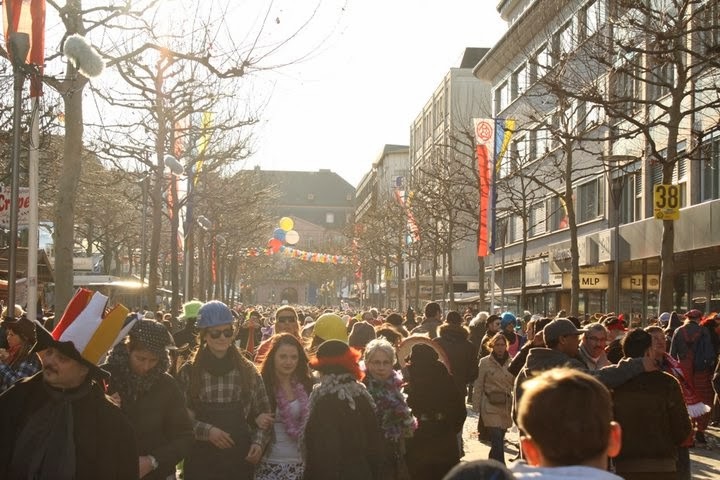 Even though carnival days are not official holidays, most businesses are closed on Rosenmontag. And those poor souls who have to work will most likely be bored. 9. Clothing – wear layers and comfortable shoes. Spring in Germany is, well, unpredictable. Whether the morning of your carnival-ing adventure is sunny or not, wear layers. You will be outside for the rest of the entire day. Many people opt for warm costumes, such as black sheep (more popular than white), polar bears, or any other furry, hairy creatures that you can snuggle yourself into. Or just make sure you find a big 'ol teddy bear to stand close to if you get cold. Just beware of frisky teddies later in the afternoon. On second thought, maybe standing too close to a teddy bear isn’t the best idea until you get to know them better (personally, I'm terrified of bears). Be safe and layer. Of course, if your carnival party is in the evening, in an event hall of some kind, this step need not be heeded. 10. Love the one or ones your with, but don’t love them (this tip is also known as ‘keep your pants or pantaloons on’). Apparently, rumour has it, that what happens during carnival stays at carnival. But more so than a Vegas trip or the entire two weeks of the Calgary Stampede, during carnival it is almost expected. Honestly, I can’t really believe that this is ‘normal’ carnival behaviour. But some people have assured me that it is, and when I pushed for exact details, the conversation came to an abrupt end. Lips sealed. Rumours of partner-tossing or wife-swapping abound, but I believe it depends on the people. Great guy and most of his friends are not carnival peeps…don’t like it, won’t go with me, need to be dragged kicking and screaming. So, I do go, but I’m a good girl at heart…who just likes to sing in the streets…with pink hair. I just love this post!! I am glad that you shared it with us. You know I also attended such an interesting event at the domestic event venues NYC. I really enjoyed that and captured loads of pictures there. I would love to share those pictures on my weblog!